What is so amazing about Grace? : Who is that sitting next to you? Yesterday consisted of one long journey it felt a little like that movie Planes, Trains and Automobiles. 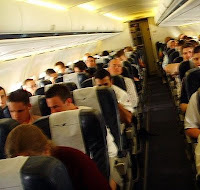 Our flight from London to Atlanta seemed to take ages to get going mainly due to seating arrangements. It almost felt like Delta had gone out of their way to ensure that anyone travelling in groups of more than 2 we sitting as far apart as possible. So the whole plane seemed to embark on one massive game of musical chairs. Nick and I were happy that our kids were somewhere else on the plane. (Sorry I didn't mean that) It seems that sitting next to someone you knew was important and the world would end if you had for 9 hours out of your life you had to sit next to a stranger. Made me think how much more important it is to have the right people sitting next to you for life. I am blessed and thankful to have so many great people to sit next too in life.